They say some things are bound to happen. A few months back Vishnu messaged me with details of books that I can review. As per our standard understanding, I need to tell him books of my liking. "Socha Bhi Na Tha" was the Book I selected that time. After a month when I inquired Vishnu about book, he informed me that the courier didn't deliver and returned. So I thought maybe it was not meant for me. Almost after two months of saying yes, Vishnu sent me a message that book arrived finally. Which means I was actually destined to review it. So here I am discussing "Socha Bhi Na Tha". It’s heart-breaking, finding the right person at the wrong time. And worse? Meeting the wrong person when the time is right. Aditi Narang is an obvious beauty. With her charming personality and magical aura, she steals hearts without much ado. When she professes her love to Shyam, he says ‘No’. Padma Lakshmi is an average girl, who goes about her life like a routine. There is nothing distinctly remarkable about her, which repels Shyam. But when proposed to marry her, he says ‘Yes’. Shyam appears quite sorted, well-settled and practical in the way he goes about life, and is the eligible bachelor that any girl would be lucky to marry. In a fierce battle between his mind and heart, tossing insecurities and juggling fears, Shyam wrongs both the women. But why would he do that? 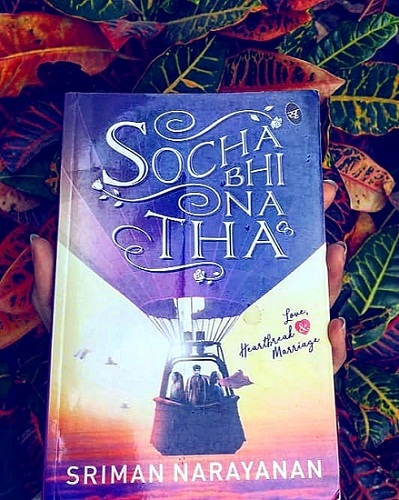 Socha Bhi Na Tha is a fast-paced, gripping story of love in various hues, extraordinary circumstances, thrilling emotions, and unheard of drama. It leaves us wondering, was it his sanity that prevailed, or his insanity that triumphed? "Socha Bhi Na Tha" is the story of Shyam, author's protagonist (not for me). Two parallels of his life are portrayed in the story. The one in 1997 when he was with bold & beautiful girl Aditi. She was in love with Shyam, but Shyam was confused and said no to Aditi. The second parallel was in 2013 when he was married to Padma, an average looking girl. But now Shyam was confused and wanted to divorce Padma. Confused about the story? Yes, so was I. Read the book to know more. The blurb of Shyam didn't match the actual character. I know it is shown as once he decides something he will do it, but on what bases he is taking those decisions, that part is not clear. This peculiar behavior put him into a dangerous category. I am a girl and thinking about a guy who marries because he is confused and leaves you without reason. How do you feel? What kind of nightmarish situation he may put you into? Being a girl I felt characters of Aditi and Padma were done great injustice. Still, a light read, one you can take on traveling. Good for beginners.